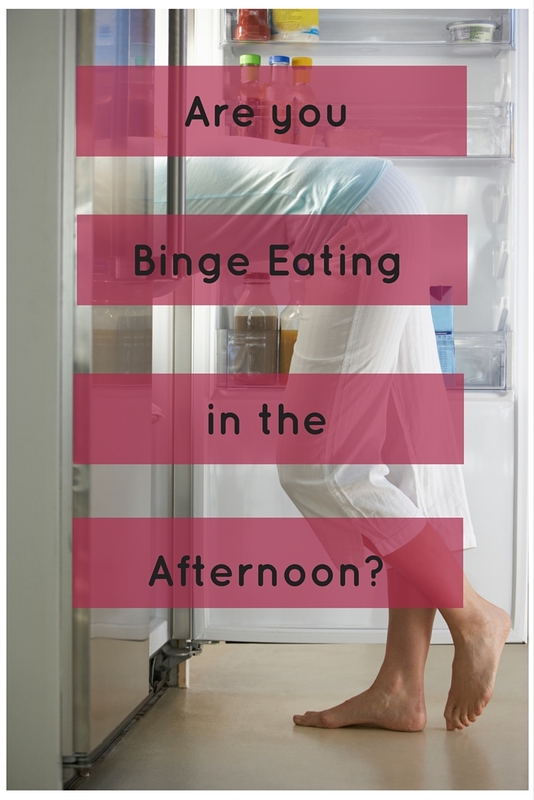 Are you Binge Eating in the afternoon? A lot of people tell me that they struggle with cravings and snacking post dinner. But some are surprised when they are feeling like having an afternoon binge between 3-5pm, either at work or right when getting home, and they are fatigued to boot! And no matter how many times it happens, they feel blind-sighted and wholly unprepared. Because we’re at work at that time, or picking up kids and distracted, we confuse this need for energy with hunger and fatigue. We think we should either take a nap, or eat something, and we tend to crave quick energy through carbs. This certainly does the trick, temporarily, but leaves us crashing later on and leaves us vulnerable to craving more and more – potentially sabotaging our ability to make sound, nutritious decisions later on because we feel we may already have “blown” it. This is not the case! First of all, knowing and anticipating that this drop in blood sugar will come, is empowering because we can be armed and ready for it. We can plan in a way that has us powering through this rough period and getting our second wind for the evening. Even if you do end up raiding the vending machine or snacking or binging on a simple or refined carb – simply dust yourself off, ADD a protein, veggie/fruit and/or healthy fat with it and this can help mitigate the spike of insulin from it. Here are some other suggestions for how to solve the afternoon binge. I’d love to hear your great ideas as well! Get up from your desk and go for a 5 minute walk or even just stretch or walk upstairs to talk to a colleague instead of emailing or instant messaging. Drink a big glass of water or have some herbal tea. Have a macronutrient-balanced snack – something with a complex carb, healthy fat and lean protein. i.e. avocado on whole wheat toast and a few slices of turkey or….an apple with unsweetened almond butter and a BabyBell cheese. Do the above and don’t leave work without a plan for dinner tonight. Spontaneity and hunger/fatigue leads to impulsive choices that we’re not always happy with. And, if you need to shop at the grocery store before going home, add this excursion to the plan as well. Head over to the Wellness Warriors FB page and send out an SOS! Don’t be critical of yourself on those days when the above suggestions or your own attempts at avoiding the 4:00 slump don’t work. You’re only human. Keep trying different variations of these techniques and think up some of your own. What are some solutions for that 2-4pm afternoon binge/slump that have helped you? Please let me know in the comments section below! 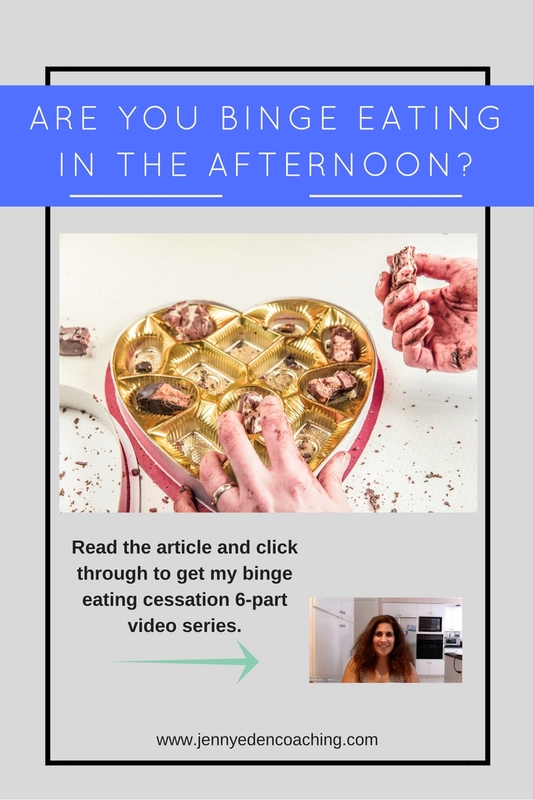 And if you’re interested in learning how to end your emotional, binge and/or stress eating behaviors, download my free 6-part video series to start learning actionable techniques right now. Binge eating a big issue for me. I use food as a crutch and an emotional filler. Have you tried to look deeper at what you are really needing other than food? It can be very hard to do this. Oftentimes, the binge is merely a symptom of something deeper, not the problem itself. Do you know what I mean? I totally binge eat especially on weekend afternoons. Thanks for sharing. I hope some of these suggestions help! Thanks for the comment. I love this post and will be sharing it with my wife. She almost always comes home from work and immediately snacks on unhealthy foods looking for energy, and then minutes later she’s asleep on the couch. I’m definitely sharing these tips with her. Thanks Jenny! Holly, I am so glad you found this helpful and will share with your wife! Let me know if she implements any of the strategies and how they go!